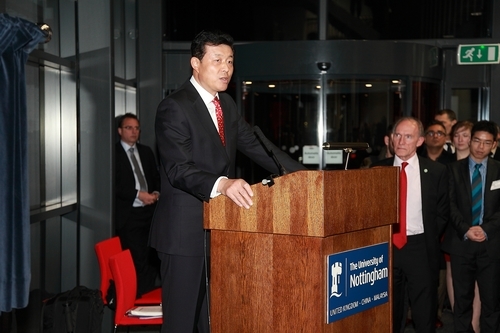 On December 19, Ambassador Liu Xiaoming attended the Opening Ceremony of Si Yuan Centre – the New China Building at the University of Nottingham. Vice Chancellor David Greenaway of the University of Nottingham, former British Deputy Prime Minister Lord Prescott, Sir John Peace, Chairman of Standard Chartered PLC, and more than 200 other distinguished guests were also present. 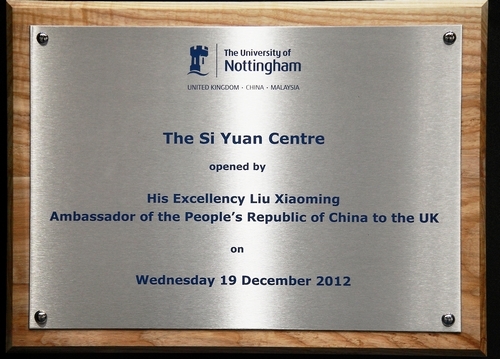 In his speech, Ambassador Liu congratulated the University of Nottingham on the opening of the Si Yuan building which houses the School of Contemporary Chinese Studies, the China Policy Institute and the Confucius Institute. He said we need to Si Yuan (think about the source) when we study China. We need to understand the traditional culture in China, and Chinese language is the foundation is Chinese culture. More than 1,000 undergraduates here in Nottingham University have signed up for Chinese language course, and this is the highest number among all universities outside China. Ambassador Liu spoke highly of the university’s devotion to contemporary Chinese studies. He said the School of Contemporary Chinese Studies is a school of neo-sinology that breaks from stereotypes, and its specialty researches are all frontier areas in today’s China. The Si Yuan Centre has attracted a very strong contingent of teaching faculties and scholars from around the world. All of them are leading experts in contemporary Chinese studies. So it is natural that the School of Contemporary Chinese Studies and China Policy Institute have become champions of neo-sinology. He urged the students and scholars at the Si Yuan Centre to carry on the spirit of innovation, openness and inclusiveness in their future analysis and study of China, and hoped they will see development and progress of modern China from a comprehensive, objective and reasonable perspective, thus turning the Centre into a base for study of new China. He hoped the Si Yuan Centre may play an even bigger role in promoting understanding between UK and China and between China and the World, and become a standard-bearer of Britain and even the entire world in contemporary Chinese studies. Vice Chancellor David Greenaway thanked Ambassador Liu Xiaoming for his long-standing support for educational cooperation and exchanges between the University of Nottingham and China. He said that since its reform and opening up, China’s rapid economic growth has made outstanding contributions to the world’s economic development. As the first foreign university establishing its branch in China, the University of Nottingham has attached great importance to developing cooperation and exchanges with China. The University of Nottingham Ningbo China, the School of Contemporary Chinese Studies and the Confucius Institute have created a close tie between the university and China. He believed that the 21st Century will be a century of development for China and said that he is willing to further strengthen the cooperation and exchanges with China in the future. Lord Prescott congratulated the University of Nottingham on the opening of the Si Yuan Centre and recalled with pleasure his trip to China back in 2006, when he inaugurated the University of Nottingham Ningbo China. He noted that the University of Nottingham Ningbo China is a model for UK-China cooperation, and hoped that the Si Yuan Centre may attract elites in various fields and become a bridge and bond promoting the bilateral relations and the friendship between the two peoples. 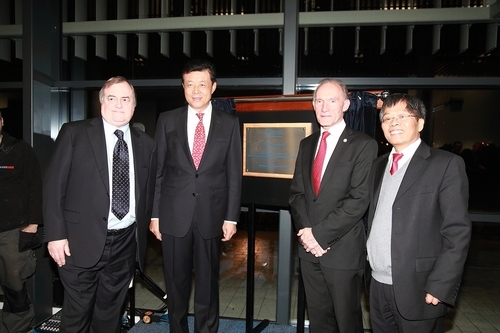 Then, accompanied by Vice Chancellor David Greenaway, Ambassador Liu inaugurated the Si Yuan Centre. When the Opening Ceremony was over, Vice Chancellor David Greenaway showed Ambassador Liu around the building. Then, the guests watched a show featuring Taichi, Chinese songs, Chinese national instrumental music, the Chinese tea ceremony and calligraphy performed by the representatives of the teachers and students of the Confucius Institute and Chinese students.